Gov. Bruce Rauner speaks to his supporters after he was elected governor of Illinois on Nov. 4, 2014. Rauner’s plan to put a redistricting referendum on the ballot was shot down by the Supreme Court of Illinois. The attempt backed by Gov. Bruce Rauner to put on the Illinois ballot a referendum that would ask voters to allow a possible redrawing of district boundaries was shot down and rejected a future rehearing last week. The ballot proposal, which the court rejected on Sept. 13, would have asked voters to alter the 1970 Illinois constitution. 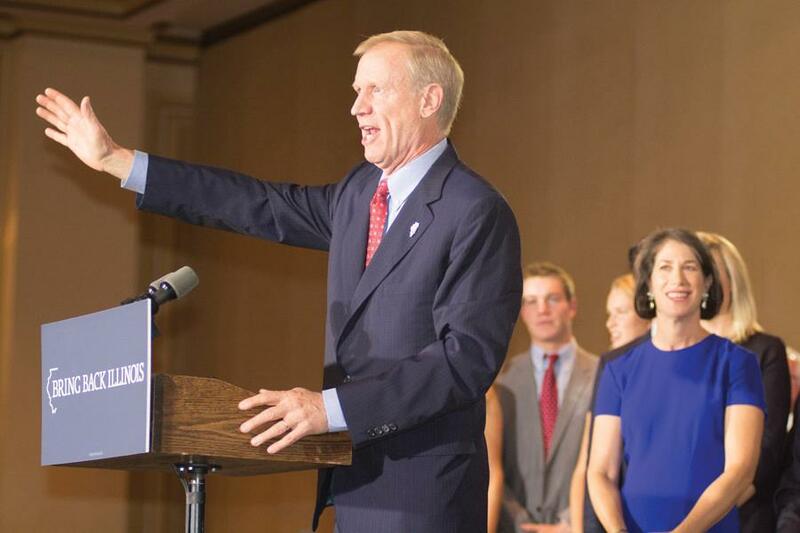 Rauner pushed the proposal, saying he wanted to protect against gerrymandering. Following the court’s 4-3 ruling, Rauner called on the Illinois General Assembly to take matters into their own hands to address term limits and independent redistricting. Justice Thomas Kilbride wrote in his decision that the petition is problematic because it designates the general auditor responsible for application process. The auditor would have control over the panel that picks those redistricting the 118 House and 59 Senate seats. His decision said because the general auditor is not mentioned in Article IV of the constitution, which deals with districting, the petition is therefore unconstitutional. “This court is obliged to respect the limitations placed on the scope of ballot initiatives,” Kilbride wrote. The dissenting argument written by Justice Robert Thomas states the court failed to save Illinois citizens from a rigged voter system. “Today, a muzzle has been placed on the people of the state and their voices supplanted by judicial fiat,” Thomas wrote. For Cook County Commissioner Larry Suffredin, the decision didn’t come as a surprise, criticizing drafters of the referendum for not following Circuit Judge Mary Mikva’s advice. Mikva essentially outlined for lawmakers a constitutionally sound petition in a decision two years ago, Suffredin said. Suffredin said the districts he represents, including Evanston and Skokie, would not see much change from redistricting. Because of the North Shore’s democratic makeup and less racial diversity, Suffredin doesn’t believe elected officials or the community will see an altering voter representation. Moving forward, Suffredin said if lawmakers continue to prevent gerrymandering through a referendum, they must strictly follow the Illinois Constitution. Nicholas Stephanopoulos, an assistant professor of law at the University of Chicago — known for writing about the efficiency gap, a statistical measure of gerrymandering — said on the surface, the Illinois case seemed like an easy one for lawmakers to pass.